You know Apocalypse, right? One of the biggest X-Men baddies, super crazy powerful, rules a tyrannical hopeless alternative future, shows up to beat down entire groups of X-Men singlehandedly? There’s a kid version of him, and this one’s definitely not as scary. Long story short: Apocalypse gets cloned as a child with happy memories as a social experiment/guilt trip to see if the supervillain’s fated to be evil and bloodthirsty. 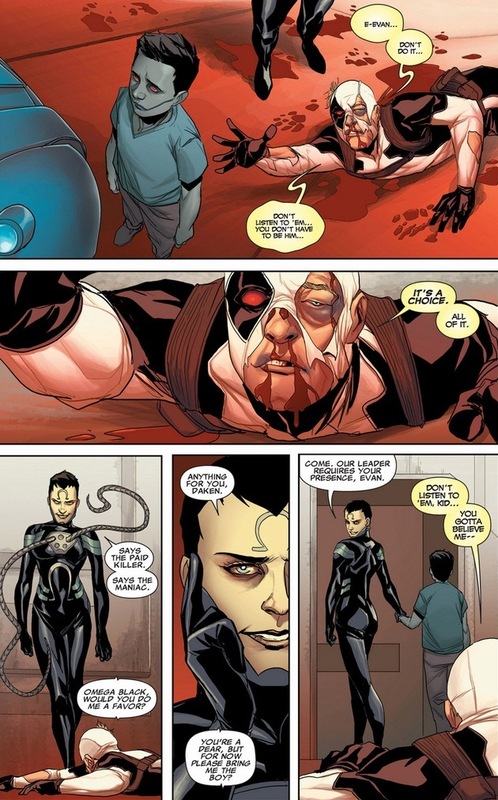 In Uncanny X-Force #32-35, written by Rick Remender and drawn by Phil Noto, with the experiment still in progress, poor Kid Apocalypse gets snatched by Wolverine’s son Daken with a van full of candy and Playstations. It’s time for the more amoral X-Men to get the kid back. And massacre all the bad guys. But mainly the first one. 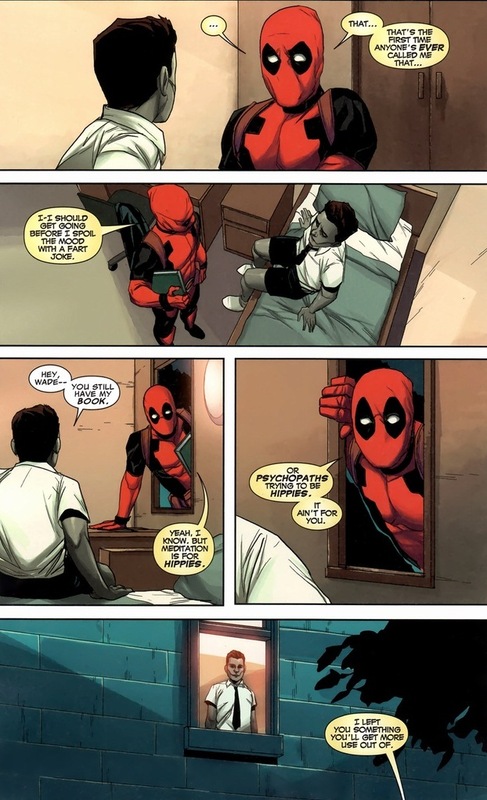 One of the few times to see Deadpool being inspirational, and more importantly, correctly influencing the life of a child. Also, the white costume’s pretty cool, right? 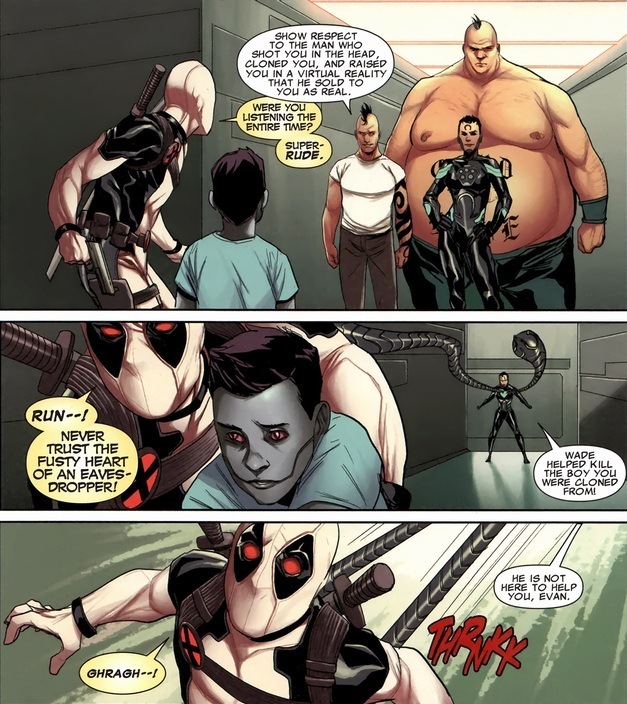 At this time, Deadpool lost his healing factor, making him doubly brave/stupid. I’m not going to show you the full fight, as it’s irrelevant to the story and I want you to buy the book, but Deadpool takes on three top-class supervillains by himself. It’s awesome. Y’see, this whole ordeal is about the supervillains attempting to make Kid Apocalypse voluntarily wear his original’s armor. 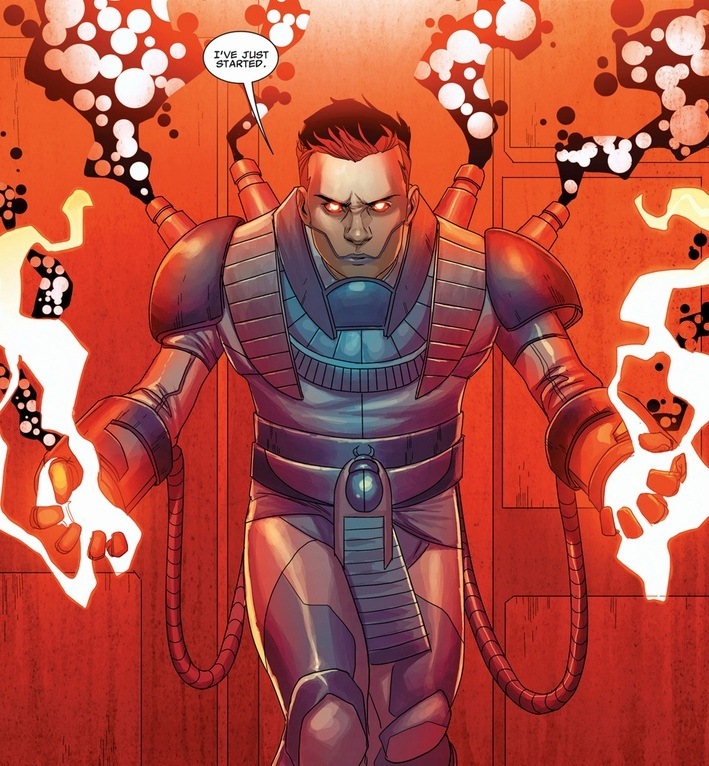 If the clone dons the Apocalypse armor (aptly named), even the preteen can fight on a galactic-ly powerful scale and at the same time almost certainly ensure the young child follows his fated path to super evil. Tough choice. Poor Deadpool lies in a bloody mess on the floor until Apocalypse is returned to the room — same as before just with a lot more stab wounds. 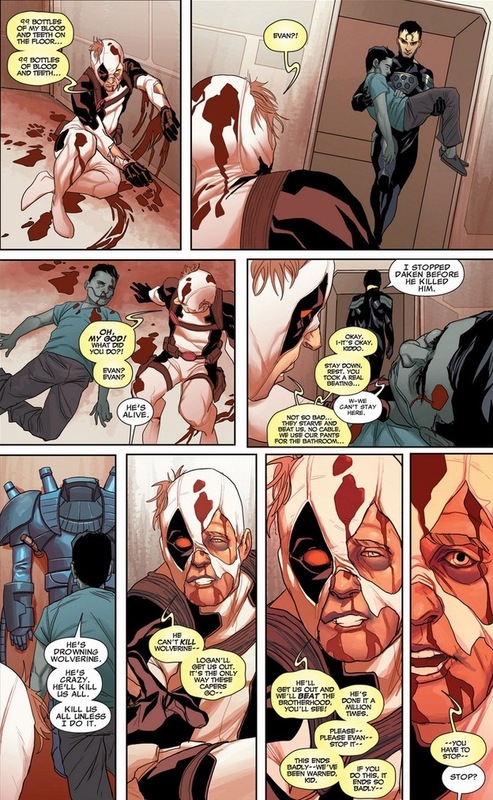 Deadpool’s rhetoric ability aside, there was really not much the half-dead mercenary could do to stop this whole mess. Fate, hormones, anger — all that jazz. But understand this, at Apocalypse’s lowest emotional point, Deadpool never gave up on him. For what the counts. We skip ahead to the epilogue, though go read the book for all the cool Apocalypse action. 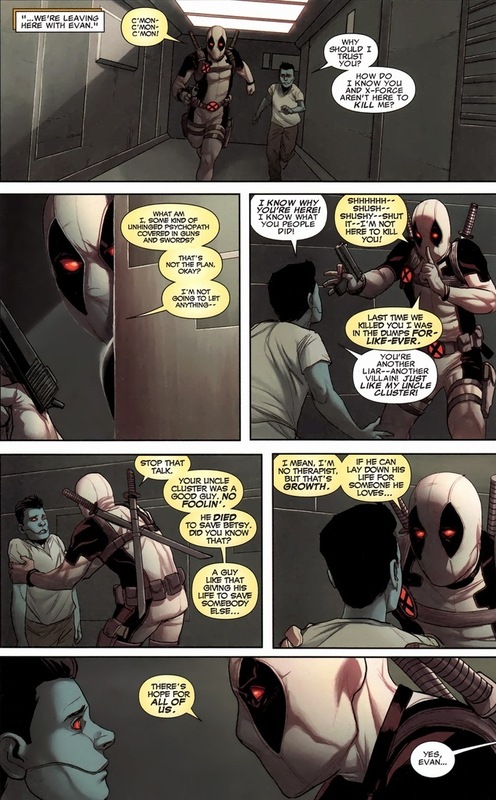 Deadpool’s most basic desire to be respected and loved by the Marvel universe remains one of the most common themes in his series. None of the superheroes really find the guy entertaining. Plus, he’s too unpredictable, morally bankrupt, unpleasant to look at, etc. But with Kid Apocalypse? 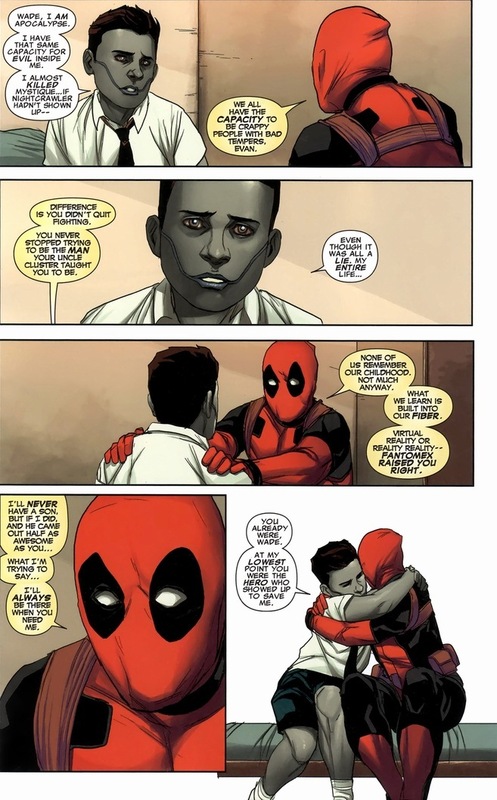 You just saw a genuine moment — a moment in Deadpool’s life that isn’t insincere, but heartfelt love and respect. All the man has ever wanted given to him by the most powerful child in the Marvel universe. Well, that and Deadpool picks out great gifts. It may sound odd, considering the huge popularity of the character, but I think I’ve never read a comic book starring Deadpool. I’m going to do that, anyway, because I ordered the first trade of Thunderbolts. The previews of this series I saw in the last months made me think it could be a great read. I used to like deathstroke better… not anymore! !